Radical Fruits is a powerful antioxidant formula that helps neutralize free radicals and protects the body against oxidative stress. Each serving (2 caplets) of Radical Fruits provides an ORAC value of over 6,000 TE, which is equivalent to 3 servings of fruits. Each organic fruit has been carefully selected and freeze-dried, a gentle process that allows the fruit to maintain its nutrient content. Evidence suggests that freeze-dried fruits may contain a higher content of antioxidants compared with products that have been dried by conventional hot air methods. 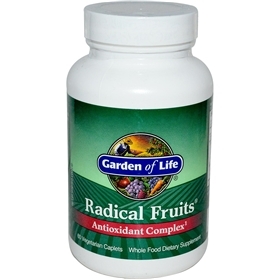 Radical Fruits is an antioxidant complex that helps neutralize free radicals and protects against oxidative stress in the body. It is a 100% natural blend of 10 antioxidant-rich fruits that support overall health. Ingredients in Radical Fruits are carefully selected to ensure a high concentration of antioxidants. ORAC: Oxygen Radical Absorbance Capacity (a measurement of antioxidant activity). Antioxidants are compounds and substances found in fruits and vegetables that inhibit oxidation and may deactivate free radicals. Free radicals are unstable, destructive molecules that can cause cellular damage, which form naturally as a result of normal metabolic processes. A diet rich in antioxidant phytonutrients may also support already healthy levels of cholesterol and a favorable LDL/HDL ratio. What are the benefits of whole fruits? Whole fruits have high nutritional integrity because they contain nutrients and other beneficial compounds, as found in whole foods. We were designed to eat whole foods that contain the necessary proteins, fats, carbohydrates, fiber, enzymes, vitamins, minerals, antioxidants and other nutrients our body needs for proper nourishment and health. Who will benefit from using Radical Fruits? Anyone seeking to help their body’s defense against oxidative stress by supplementing with a powerful antioxidant formula that helps neutralize free radicals. Adults may take 2 caplets per day. May be taken with or without food.